WinADay casino is offering a fantastic $12 no deposit video poker bonus all this week so that players can try two brand new video poker games. 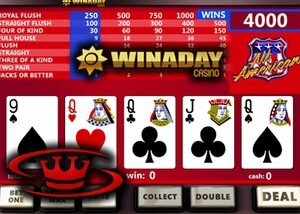 With the free $12 no deposit bonus, all players at WinADay casino can try the brand new All American and Deuces & Joker Wild video poker titles. Both of these new video poker games are single-hand variations of the classic Jacks or Better video poker game. All American has a higher payout for a Straight Flush and Straight and Flush winning hands. The maximum amount that players can win on this video poker titles is 4,000 coins and this is if you get a Royal Flush on a 5 coin bet. Players can select coin values from $0.1 to $5. Deuces & Joker Wild offers up to 5 wild cards as the Deuces and Joker and wild. The maximum amount that players can win on Deuces and Joker Wild is 10,000 coins and this is for hands with 5 wild cards. Michael Hilary, manager at WinADay Casino, said, "We created four new premium slots over the last year or so - Olympus, Ice Crystals and Zodiak - and a couple of penny slots, I'm really excited to be adding some new video poker games." All players at WinADay Casino can enjoy two very special bonuses for a limited time when they sign up to play the new games. There is a $12 free chip no deposit bonus as well as up to 70% deposit bonus using the following bonus codes. You can use your free casino money to try out all the games risk-free and you have the chance to win real money too. The deposit bonus value depends on the VIP status of players and there are wagering requirements attached to both bonuses. It is important to read the terms and conditions for each of these bonus offers before claiming so that you know exactly what games you can enjoy as well as your play through requirements for withdrawals. WinADay Casino offers 34 premium slots games as well as a variety of penny slots and video poker titles. All the casino games are mobile compatible and can be enjoyed on iPhone, iPad, and Android smartphones and tablets.